Conservatives On The Hunt For Mr. (Or Ms.) Right At the Western Republican Leadership Conference in Las Vegas, about 600 die-hard Republicans were considering their options. Mitt Romney may be the presumed front-runner, but most activists mention his name as just one possibility. Conservatives continue to look for other options. Mitt Romney has been at or near the top of most polls since the presidential campaign began. But he's generally had company in the top tier. For a while last summer, it looked like Minnesota Rep. Michele Bachmann was a contender. Then Texas Gov. Rick Perry announced he was running and shot to the head of the pack. Right now, it's businessman Herman Cain who is Romney's chief rival. At the Western Republican Leadership Conference (WRLC) in Las Vegas, about 600 die-hard Republicans were considering their options. Mitt Romney may be the presumed front-runner, but most here mentioned his name as just one possibility on their short list of interesting candidates. Sometimes Romney didn't even make the list. Chuck Muth said he was a "Newt, Cain, Perry, Ron Paul" kind of guy. He heads a Las Vegas conservative organization called Citizen Outreach. Many of the conservatives who make up the bulk of Republican primary voters just don't feel that Romney is one of them, says Muth. "If Romney is the nominee, we'll be there for him," Muth says. "But if we can possibly have somebody who's a stronger conservative, we'd rather have that." Right now, the candidate who's leading that category is Herman Cain. When he addressed some of the conference attendees, he was greeted with cheers. His performance was vintage Cain: optimistic and plain-spoken. For example, he said that "stupid people are ruining America." But "the good news" — Cain usually has some good news — "is we can outvote them. We can!" The role of chief Romney alternative was previously filled by Perry until some bad debate performances eroded his support. 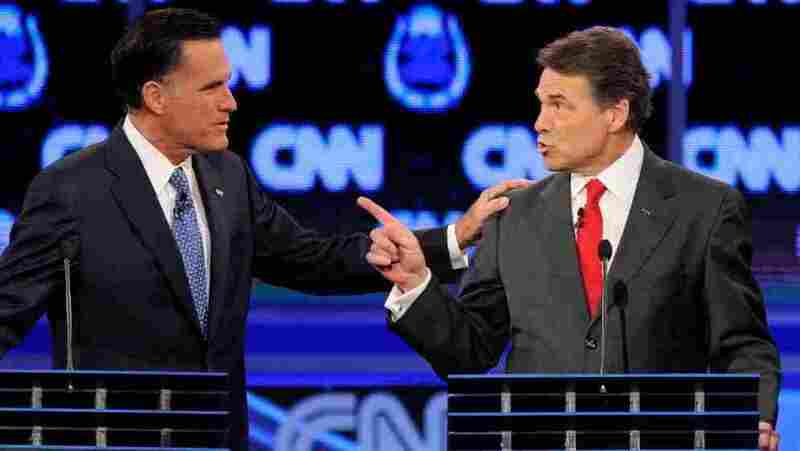 At the CNN debate Tuesday night that kicked off the conference, Perry was clearly trying to regain his former position by aggressively attacking Romney, calling him a hypocrite and shouting him down when he tried to respond. The next day, WRLC attendees mulled over Perry's performance at a cocktail reception in The Garden of the Gods at Caesars Palace. The very name of the place invited them to mull over the flaws of the mortal candidates who were vying to win their support. In the case of Perry, most of the reactions to his debate performance could be summarized as, "Yikes, what was that?" "Perry just totally dug his own grave," says Nick Pitson of Salt Lake City. "I felt like his demeanor at the debate was kind of petty and cheap. " Pitney's favorites are Romney and Herman Cain. And it's not just Cain's famous 9-9-9 tax plan that appeals to conservatives. Wendy Bidwell of Baltimore compares Cain's appeal for Republicans to Barack Obama's appeal for Democrats four years ago. "He definitely is extremely likable," Bidwell says. "He has a lot of charisma, he really makes you feel that he's going to do everything he can to do what he says he's going to do." And Terry Turner of Salt Lake City says Cain's lack of political experience is a plus. "His business experience and his lack of political experience is in a way intriguing," Turner says. "Because he doesn't have a lot of political baggage such as Mitt Romney." In other words, it's hard to go after Cain on his record. He has no health care plan to defend like Romney does. He hasn't backed in-state tuition for undocumented college students like Perry has. But Cain does tend to shoot from the hip. And at the very moment that some of these conservatives were singing his praises, Cain was on CNN seeming to stake out a position on abortion that might have surprised them. Cain told Piers Morgan on Wednesday that "it ultimately gets down to a choice that that family or that mother has to make. Not me as president, not some politician, not a bureaucrat ... And whatever they decide, they decide." Then again, Cain said in the same interview that he opposed abortion under any circumstances and in a statement he put out the following day he affirmed he was 100 percent pro-life. So conservatives may be hunting for their ideal candidate for a while. At least until the time comes when they just want to figure out which one has the best chance of defeating Barack Obama.